The ship has a gross tonnage (GT) of 70,327 tons and is 963 ft (294 m) long. She had a top speed of 32.5 knots (60.2 km/h) using her original steam turbine powerplant, which was increased to 34 knots (63 km/h) when the vessel was re-engined with a diesel electric powerplant. By the mid 1960s transatlantic travel was dominated by air travel due to its speed and low cost relative to the sea route, and expansion of air travel showed no signs of slowing down. 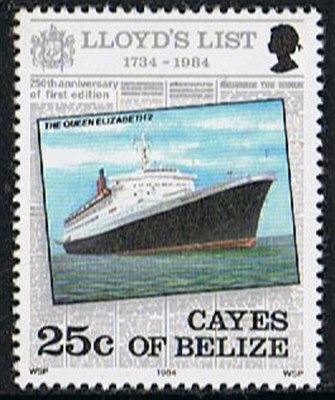 Conversely, the Queen Mary and Queen Elizabeth were becoming increasingly expensive to operate, and both internally and externally were relics of the pre-war years. However, Cunard did not want to give up the business of passenger service, and so gambled $80 million on a new ocean liner to replace the original Queens, as well as to compete with the French Line's SS France. 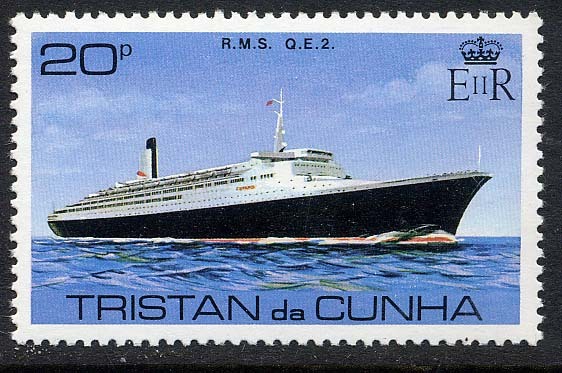 Realising the decline of transatlantic trade, and the rising costs of fuel and labour, Cunard decided their new ship had to be smaller and cheaper to operate than her predecessors; the design requirements of the new ship were that she was to run at the same service speed of 28.5 knots (52.8 km/h) as the previous Queens, use half the fuel of the older ships, and draw seven foot less draft to allow her to enter ports that the old Queens could not. The new liner was to have the ability to pass through the Panama Canal. Originally designated Q4 (a previous ship design Q3 had been abandoned due to falling passenger revenues on the North Atlantic), she was to be a three-class liner. However, looking to the France, designs were changed to make Q4 a two-class liner that could be modified into a single-class cruise ship, thereby allowing the ship to ply the Atlantic during the peak summer season, as well as warmer waters during the winter. The Queen Elizabeth 2 was built by the Upper Clyde Shipbuilders in the John Brown Shipyard in Clydebank, Scotland. Her keel was laid down on 5 July 1965, as hull number 736, and was launched and named on 20 September 1967 by Queen Elizabeth II, using the same pair of gold scissors her mother and grandmother used to launch the Queen Elizabeth and Queen Mary, respectively. On 19 November 1968 she left John Brown's fitting out berth, and sailed down the River Clyde to the Firth of Clyde Dry Dock at Inchgreen, Greenock, for final trials and commissioning. 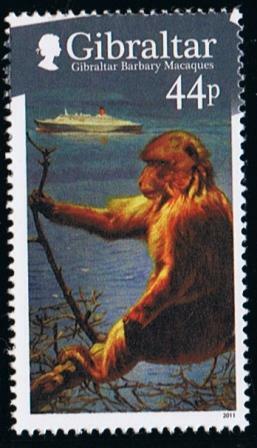 After sea trials in the Irish Sea a "Mini maiden voyage" to Las Palmas de Gran Canaria set out on 22 April 1969. 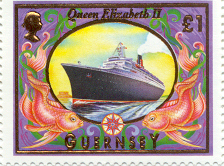 The Queen Elizabeth 2's maiden voyage, from Southampton to New York City, commenced on 2 May 1969, taking 4 days, 16 hours and 35 minutes. Prince Charles was the first "civilian" passenger to board the ship, on her voyage from the shipyard in Clydebank to drydock in Greenock. On board for the short journey was her first captain, William (Bil) Warwick. In 1971, she participated in the rescue of some 500 passengers from the burning French Line ship Antilles. On 17 May 1972, while travelling from New York to Southampton, she was the subject of a bomb threat. She was searched by her crew, and a bomb disposal team parachuted into the sea near the ship. No bomb was found, but the hoaxer was arrested by the FBI. This incident went on to inspire the 1974 Richard Lester feature film Juggernaut. 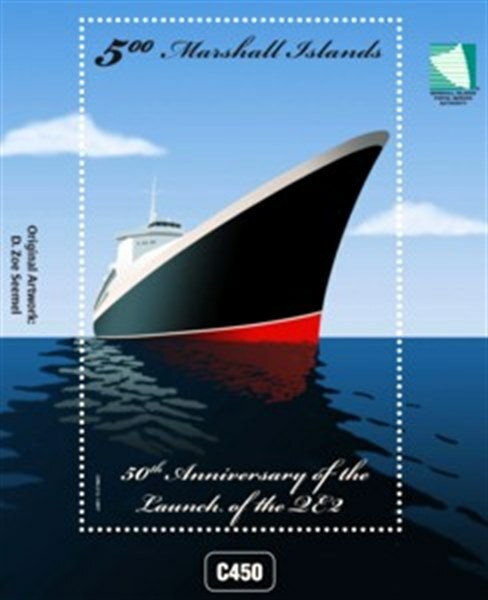 The following year the QE2 undertook two chartered cruises through the Mediterranean to Israel in commemoration of the 25th anniversary of the state's founding. One kitchen on the ship was koshered for Passover, and Jewish passengers were able to celebrate Passover on the ship. In April 1982, she took part in the Falklands War, carrying 3,000 troops and 650 volunteer crew to the south Atlantic. She was refitted in Southampton in preparation for war service, including the installation of three helicopter pads, the transformation of public lounges into dormitories, fuel pipes ran through the ship down to the engine room to allow for refuelling at sea, and the covering of carpets with 2,000 sheets of hardboard. Over 650 Cunard crewmembers volunteered for the voyage to look after the 3,000 members of the Fifth Infantry Brigade, which the ship transported to South Georgia. During the voyage the ship was blacked out and the radar switched off in order to avoid detection, steaming on without modern aids. 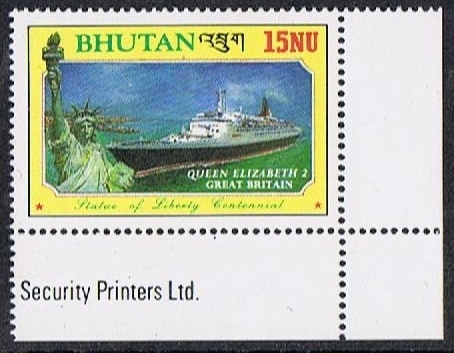 She returned to the UK in June 1982, where she was greeted in Southampton Water by Queen Elizabeth, the Queen Mother on board the Royal Yacht Britannia. Peter Jackson, the captain of the QE2 responded to the Queen Mother's welcome: "Please convey to Her Majesty Queen Elizabeth, the Queen Mother, our thanks for her kind message. Cunard's Queen Elizabeth 2 is proud to have been of service to Her Majesty's Forces." 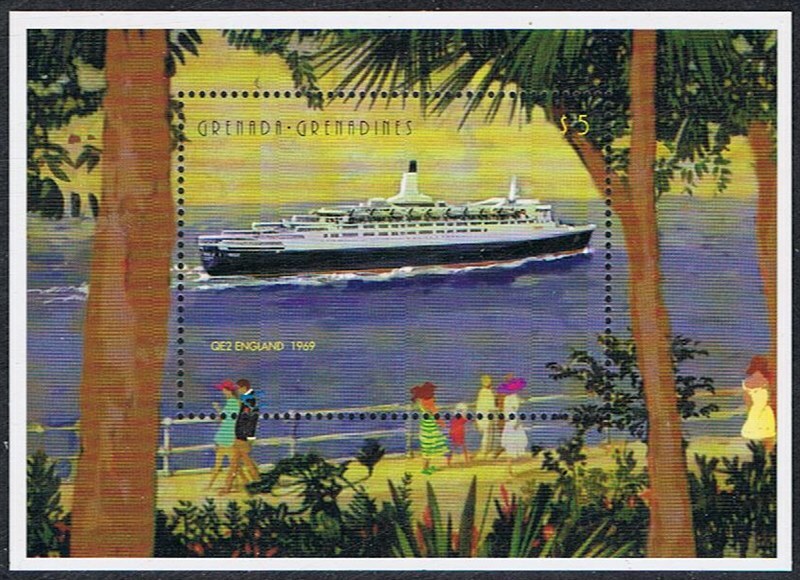 The ship underwent conversion back to passenger service, with her funnel being painted in the traditional Cunard orange-red with black stripes, but her hull painted an unconventional light charcoal grey. This colour proved difficult to maintain, and so was reverted to traditional colours in 1983. On 7 August 1992, her hull was extensively damaged when she ran aground south of Cuttyhunk Island near Martha's Vineyard, while returning from a five day cruise to Halifax, Nova Scotia along the east coast of the United States and Canada. A combination of her speed, an uncharted shoal and underestimating the increase in the ship's draft due to the so-called squat effect led to the ship's hull scraping rocks on the ocean floor. The accident resulted in the passengers being evacuated at nearby Newport, Rhode Island and the ship being taken out of service while repairs were made in drydock. Several days later, divers found red paint on previously uncharted rocks in the vicinity of where the ship was said to have hit bottom. 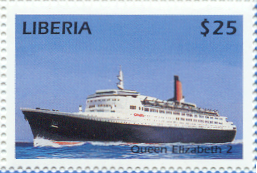 By the mid 1990's it was decided that QE2 was due for a new look and in 1994 the ship was given a multi-million dollar refurbishment in Hamburg. QE2 emerged from the refit having every major public room refurbished. She also appeared for the first time with a Royal Blue hull. In 1995, she encountered a freak wave, estimated at 90ft, caused by Hurricane Luis in the North Atlantic Ocean. One year later, during her twentieth world cruise, she passed her four millionth mile mark. The ship had sailed the equivalent of 185 times around the planet. 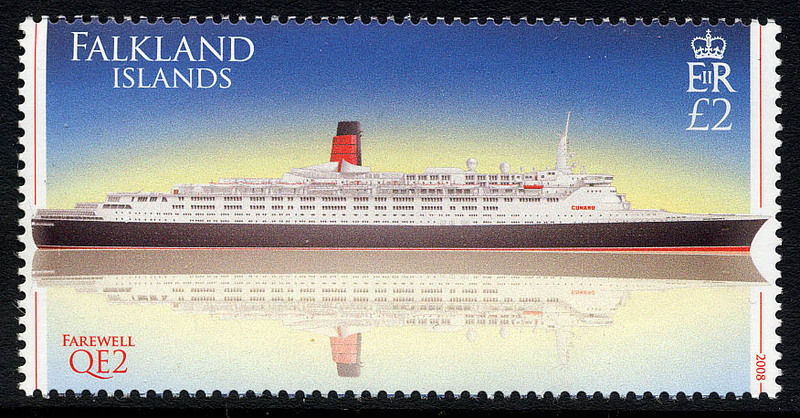 The QE2 celebrated the 30th anniversary of her maiden voyage in Southampton in 1999. In three decades she had 1,159 voyages, sailed 4,648,050 nautical miles (5,347,018 mi, 8,605,209 km) and carried over 2 million passengers. In late 1999, QE2 was treated to a multi-million dollar refurbishment which included refreshing various public rooms, and a new colour palate in the passenger cabins. This refit also included the mammoth task of a complete hull strip (back to the bare metal) and repaint in traditional Cunard colours of matte black with a white superstructure. 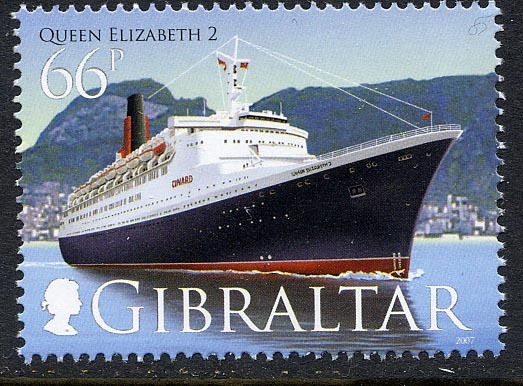 While she was taken off the traditional "transatlantic" route (which was taken over by the Queen Mary 2 in 2004) the QE2 still undertook an annual world cruise and regular trips around the Mediterranean. At the end of her 2005 world cruise, certain pieces of her artwork were damaged when some crew members who had become inebriated at an onboard crew party, went on a vandalism rampage through the public areas of the ship. 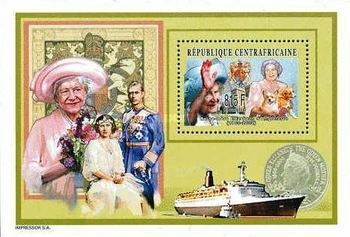 A unique tapestry of Queen Elizabeth II, commissioned for the launch of the ship, was thrown overboard. Further, an oil painting of the QE2 and two other tapestries were damaged, along with a part of the entertainment area and a lifeboat. The crew members involved were dismissed from service, with charges pending. 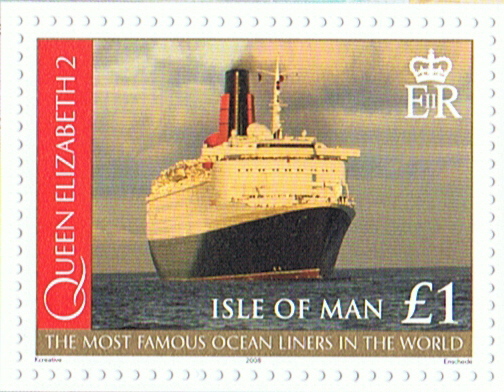 On 5 November 2004 the QE2 became Cunard's longest serving ship, surpassing the RMS Aquitania's 35 years. On 20 February 2007 the QE2, while on her annual world cruise, met her running mate and successor flagship QM2 (herself on her maiden world cruise) in Sydney Harbour, Australia. This was the first time two Cunard Queens had been together in Sydney since the original Queen Mary and Queen Elizabeth served as troop ships in 1941. On 3 October 2008, Queen Elizabeth 2 set off from Cork for Douglas Bay on her farewell tour of the British Isles, before heading for Liverpool. She left Liverpool and arrived in Belfast on 4 October 2008, before moving to Greenock the next day (The ship's height with funnel makes it impossible to pass under the Erskine Bridge so Clydebank is not reachable). She then sailed around Scotland to the Firth of Forth on 7 October 2008, where she anchored in the shadow of the Forth Bridge. The next day, following an RAF flypast, she left amidst a flotilla of small craft to head to Newcastle upon Tyne, before returning to Southampton. QE2 left Southampton for the last time on 11 November 2008, seen off by a huge fireworks display, a flotilla of smaller craft and a crowd estimated in the thousands. Earlier in the day, she had run aground on a sand bank her way into port, but diving inspections revealed no damage. At the time of her retirement in November 2008, QE2 had sailed over six million miles, carried 2.5 million passengers and completed 806 trans-Atlantic crossings. 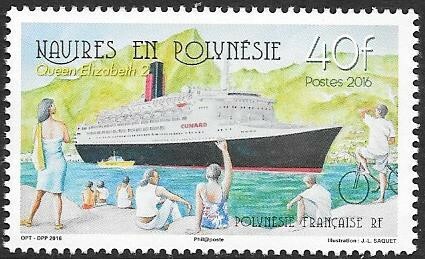 As Queen Elizabeth 2 approached her 40th anniversary with Cunard, questions began to circulate as to how much longer the ship could stay in service. Cunard had to consider the economics of maintaining a 40-year-old liner in service, particularly with the new SOLAS safety regulations that would apply from 2010 onward. 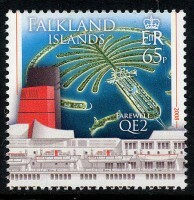 Both Southampton and Clydebank had offered to take over QE2 after her retirement, but on 18 June 2007 it was announced that the ship had been purchased by the Dubai investment company Istithmar for $100 million. Her final voyage from Southampton to Dubai began on 11 November 2008, arriving on 26 November in time for her official handover the following day. She will now be refurbished and berthed permanently at the Palm Jumeirah from 2012 as a "a luxury floating hotel, retail, museum and entertainment destination." The refurbishments will see the QE2 transformed into a must-see tourist destination in Dubai. 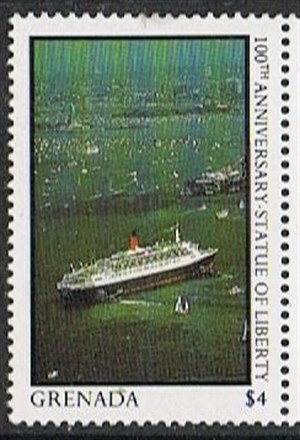 In a ceremonial display before her retirement, the QE2 met the Queen Victoria and the Queen Mary 2 near the Statue of Liberty in New York City harbour on 13 January 2008, with a celebratory fireworks display; the QE2 and QV had made a tandem crossing of the Atlantic for the meet. This marked the first time three Cunard Queens have been present in the same location, and Cunard stated this will be the last time these three particular ships will meet, due to the impending retirement of the QE2. However, due to a change in the QE2's schedule, the three ships met again in Southampton on 22 April 2008. QE2 shared the harbour at Zeebrugge with Queen Victoria on 19th July 2008. Other memorable farewell cruises include the 2008 world cruise and Round Britain Farewell. On 5 October 2008, during her Round Britain Farewell, the QE2 returned to the Firth of Clyde for her final visit to Greenock where she had been commissioned, down the River Clyde from Clydebank where she had been built. She was escorted by HMS Manchester and visited by MV Balmoral. The farewell was viewed by large crowds and concluded with a firework display. QE2 completed her final trans-Atlantic crossing from New York to Southampton in tandem with her successor, QM2. The two liners departed New York on October 16th and arrived in Southampton on October 22nd. 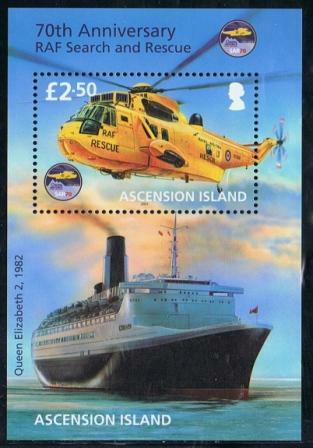 This marked the end of QE2's trans-Atlantic voyages. On her final arrival into Southampton, QE2 (on 11 November, 2008, with 1,700 passengers and 1,000 crew on board) ran aground in the Solent at the Southampton Water entrance at 5.26am. BBC reported "Cunard has confirmed it touched the bottom at the Brambles Turn sandbank (sandback) near Calshot, Southampton Water, with three tugs attached to her stern (0530 GMT). 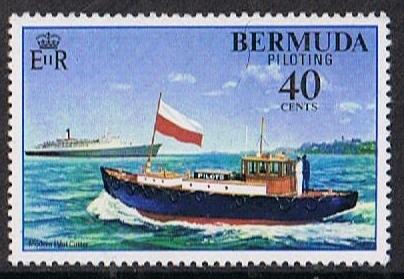 A fourth tug secured a line to the ship's bow." Solent Coastguard stated: "Five tugs were sent out to assist her getting off the sandbank, and she was pulled off just before 6.10am. She has been re-floated and is under way under her own power and heading back to her berth in Southampton. She had only partially gone aground, and the tugs pulled her off." Once safely back at her berth, preparations continued for her farewell celebrations. These were led by the Duke of Edinburgh who toured the ship at great length. He visited areas of interest including the Engine Control Room. He also met with current and former crew members. During this time, divers were sent down to inspect the hull for any possible damage caused by the vessel's earlier mishap - none was found. 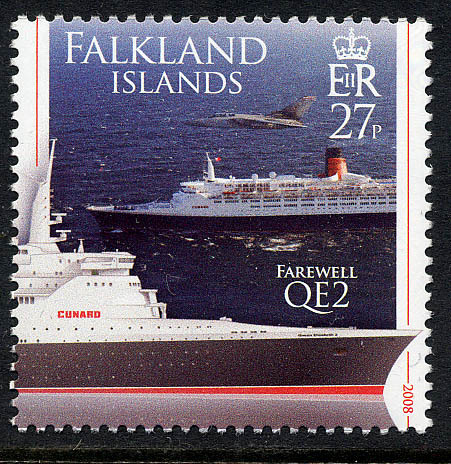 The QE2 left Southampton Docks for the final time at 1915 GMT on 11 November 2008, to begin her farewell voyage (aptly named "QE2's Last Voyage". She was passed to the Nakheel company, behind the Palm Jumeirah, part, of Dubai World, Dubai on 26 November. 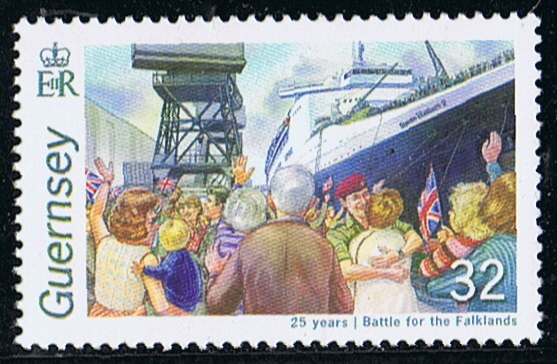 The decommissioning of the ship was particularly poignant for the QE2's only permanent resident, Beatrice Muller, aged 89, who lived on-board in retirement for 14 years, at a cost of some £3,500 (~€4300, ~$5400) per month. QE2 arrived in Dubai on the evening of 26 November 2008 in a flotilla of 120 smaller vessels, led by MV Dubai, the personal yacht of Sheikh Mohammed, ruler of Dubai. She was greeted with a fly-past from an Emirates Airbus A380 jet and a huge fireworks display, while thousand of people gathered at the Mina Rashid, waving the flags of Great Britain and the United Arab Emirates. Since her arrival in Dubai QE2 has remained moored at Port Rashid. Shortly after her final passengers were disembarked, she was moved forward to the cargo area of the port, to free up the passenger terminal for other cruise vessels. 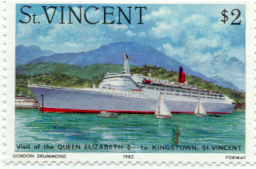 Presently, QE2 remains an ocean going vessel, and as such, Ronald Warwick (former Captain of QE2, QM2 and retired Commodore of the Cunard Line) has been employed by V-Ships (who are managing QE2 during her de-fit) as the vessels legal master. It is currently anticipated that QE2 will be moved to the Dubai Drydocks in early 2009 to begin a series of refurbishments which will result in her being converted into a floating hotel. Upon completion she will be moved to The Palm Jumeirah to take up residence at the QE2 Precinct. 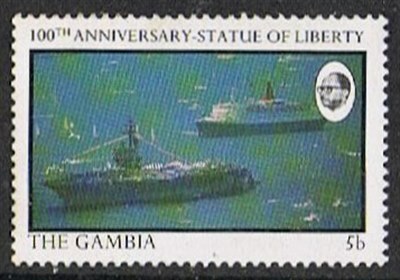 As given by the issues of this stamp by the Ascension Post. 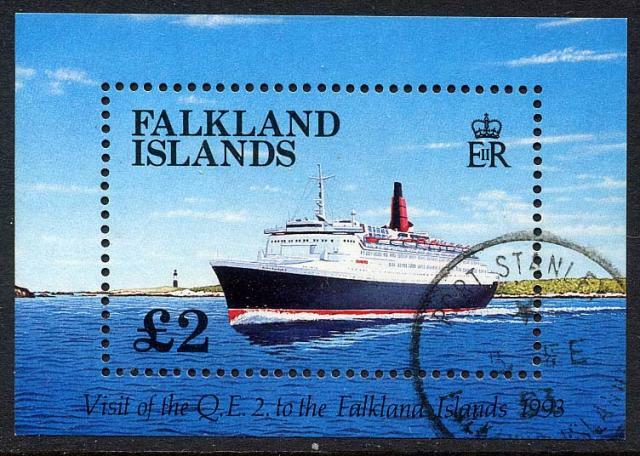 During the Falkland’s Conflict a number of commercial vessels were requisition to augment the task force and these included Cunard’s RMS QE2, which was to be used as a troop ship. With her fine fixtures and fittings removed and boards laid to protect the ship’s carpets, her conversion to a troop ship included the installation of two helicopter flight decks, one over the forecastle and the other over the ship’s two outdoor swimming pools aft. At Ascension Island, the Commander Land Forces Falklands, Major General Jeremy Moore of the Royal Marines joined the ship and continued south to the war zone, where ships had already been sunk and where the threat came not just from the Argentines but also the weather and indeed icebergs. After General Moore had departed to join the Task Force’s flagship, QE2 altered course to South Georgia, where her embarked troops were transferred to ships that were more suited to navigating in the confined waters of the Falklands and the survivors from the commercial and warships that had been sunk were embarked for their passage home. QE2’s war service ended on 11 June 1982 when she arrived in home waters to a rapturous welcome. Ascension 2011 £2.50 sg?, scott? Bhutan 1986 15n sg684, scott? Gibraltar 2011 44p sg?, scott? 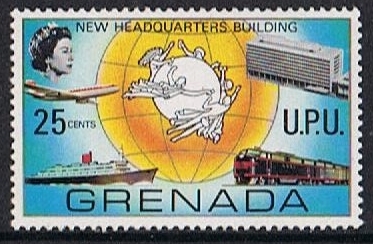 Grenada 1970 25c sg410, scott? Guernsey 2007 32p sg?, scott? 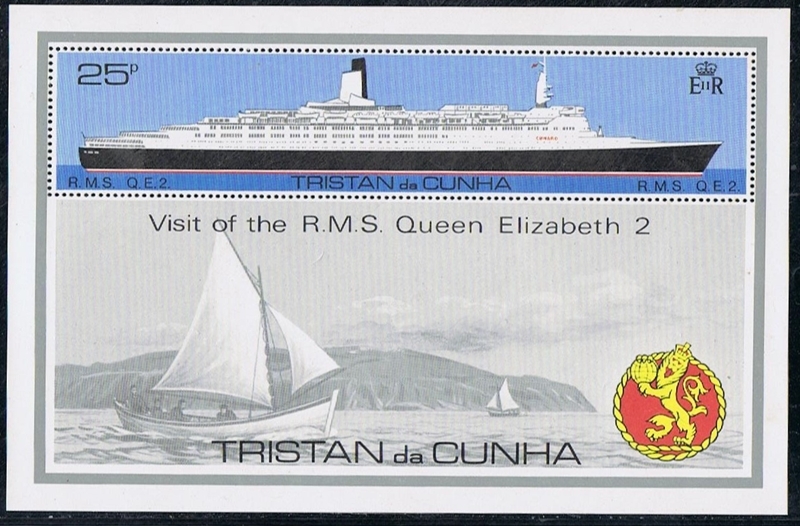 Tristan da Cunha 1979 25p sgMS263, scott? She is still languishing alongside in Dubai in 2014, she has now been stuck in Dubai for six years, to refit her in a floating hotel has failed and an other plan to use her in Zhoushan, China as a floating hotel in 2013 is also shelved. She has a group of workers living on board to maintain the vessel. Last edited by aukepalmhof on Tue Dec 06, 2016 8:02 pm, edited 1 time in total. 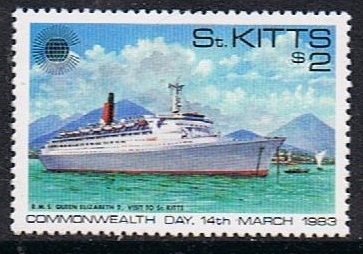 St Kitts 1983 $2 sg109, scott? Cayes of Belize 1984 25c sg?, scott? Marshall Islands 2017 $5.00 sgMS?, scott? 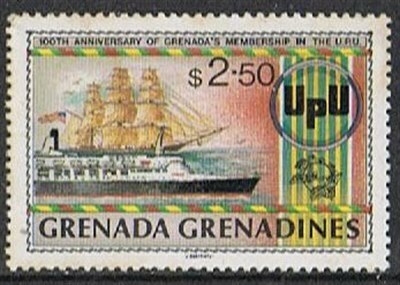 Grenada 1987 $4 sg 1652, scott ? Last edited by aukepalmhof on Sat Feb 16, 2019 2:03 am, edited 4 times in total. As a new user I have not learned how to attach illustrations. I give here the numbers (Michel, Stanley Gibbons and Scott) to QE II-stamps which is not given earlier. Illustrations will come if/when I learn how to do it. 1980. Mi 513. SG 548. Sc 515. 1981. Mi Bl 16. SG MS 499. Sc 467ª. 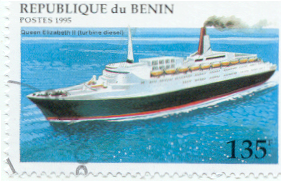 Benin 1995, 135 Fr. StG.1289. French Polynesia 2016, 40 Fr. StG.? St. Vincent 1982, $2, StG.709.